Life in the city can be dirty work. Loud, overcrowded and overpriced… it takes resolve to live and love side-by-side. To celebrate those who endeavour, OFF LIFE and Print Club London are coming together for 'As One' – an illustration project and live event that has commissioned six young artists to turn the mirror on London. Throughout May Isabel Greenberg, Jamie Coe, Brigid Deacon, Andrew Rae, David Biskup and Elliot Kruszynski have each created a short comic that snapshots their life in the modern city. Warts and all. 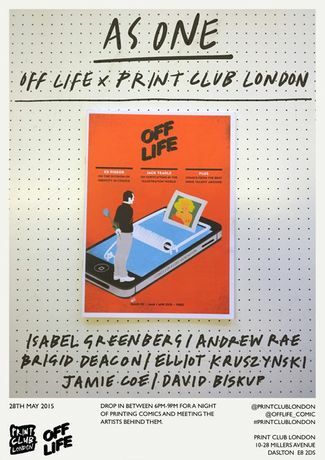 Come and join us on May 28th for a live printing night at the Print Club London Studios to meet the artists, screen print your own copy of the limited edition artworks and together drink to this dirty life of ours. Tickets for the event are extremely limited. Grab yours while you can!